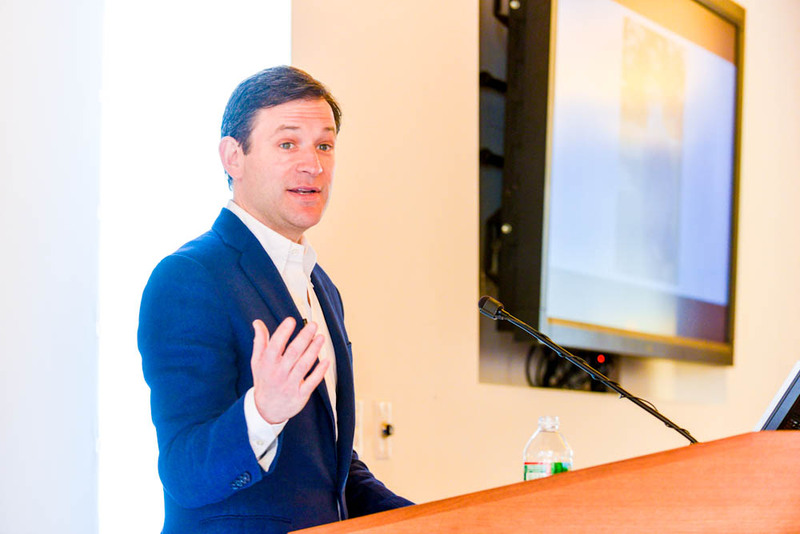 This was the message delivered by Dan Harris, correspondent and co-anchor for ABC’s “Nightline” and “Good Morning America Weekend,” during the keynote speech at the 13th annual Lenny Lecture sponsored by Dana-Farber’s Leonard P. Zakim Center for Integrative Therapies, Adult Survivorship Program, and Perini Family Survivors’ Center. His talk centered on the powerful story of how he used 5-10 minutes of daily meditation to reduce the anxiety he felt in his high pressure job – anxiety he said led to drug use and an on-air breakdown. Meditation is one of several integrative therapies offered to adult and pediatric patients at Dana-Farber’s Zakim Center. Learning to let go of negative or fearful thoughts through meditation can help patients reach a more peaceful state of mind and feel more physically relaxed during cancer treatment. Harris noted that research has shown the practice to lower stress hormones and blood pressure, boost the immune system, and mitigate anxiety and depression. Sports teams such as the Seattle Seahawks of the National Football League are adopting meditation techniques, he said, as is the U.S. Military in an effort to decrease instances of post-traumatic stress disorder. The evening also served as a homecoming of sorts for Harris. He is the son of Dana-Farber Chief of Radiation Oncology Jay Harris, MD, and Massachusetts General Hospital Pathologist Nancy Lee Harris, MD, both of whom are professors at Harvard Medical School. Your next story: What Are the Most Common Symptoms of Childhood Cancer?